I recently blogged about hearing a horse on the street beneath my balcony and had comments asking me to expound on the difference between the sound of a horse or a donkey passing by. The differences are several. First is the heavier resonance of the horse's hoof; the bulk of the beast makes a more resounding clop on the asphalt. The donkeys, with their smaller frames and smaller hooves, make lighter taps, and when they are in a hurry the rhythm is smudged between a staccato and a shuffle as they struggle to move their stiff little legs fast enough to suit their drivers. 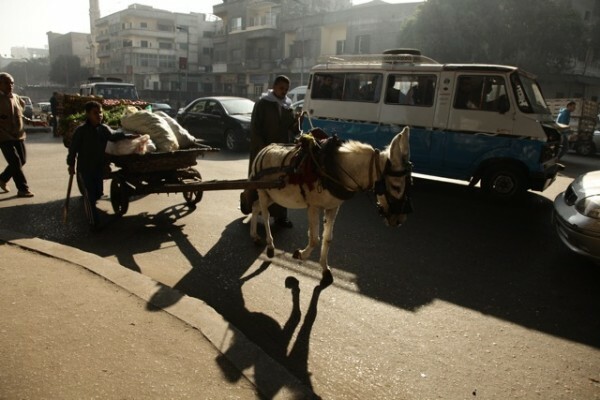 Plenty of drivers allow their donkeys to walk, though, but I cannot think of instance of seeing a horse that was allowed to plod along. It's as if having a showier creature pulling their carts forces the drivers to put on a show. They hurry their animals down the streets, heedless of how their shod hooves slip, how the speed bumps make them stumble. Speaking of being shod, not all of the donkeys are, so their steps lack the metallic ring of shoes. Back to the idea of show, I hear more bells and jingles (buckles or trinkets, I don't know) on horse harnesses than on those of donkeys. Thank you SOOOO much! You are such a sweetie! And Julien is a sweetie! This is great! And why don't our cities have horses and donkeys, I ask you? Do you have any idea what the first cart might have on it? The second obviously has vegetables and things. It has cabbages! Green and purples ones under that blanket. In the big white bag is some kind of leafy plant, possibly fodder for the horse. Such an educational and thought-provoking entry! 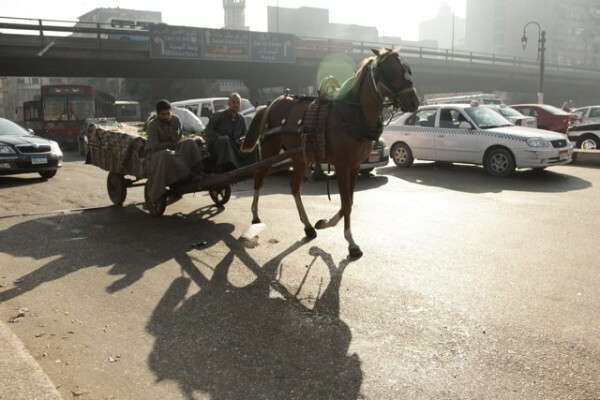 Are there many horses and donkeys around in Cairo? Do they use oxes also there?